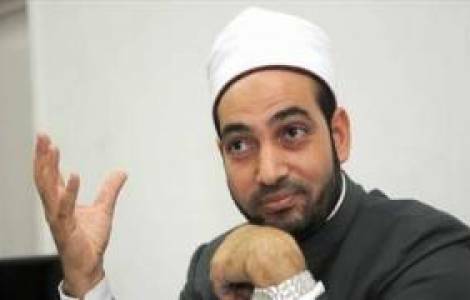 AFRICA/EGYPT - Trial for religious contempt against the Islamic preacher who called Christians and Jews "infidels"
Cairo (Agenzia Fides) - Sheikh Salem Abdul Jalil has tried to soften the controversy caused by his recent televised statement in which he defined Christians and Jews "infidels" and their doctrine "corrupt". But the controversy around the "case" does not seem to stop: several jurists - including Coptic Naguib Gabriel - denounced the Muslim Sheikh to the judicial authority on charges of religious contempt. And Jalil could appear before the judges on June 25th. The case, as reported by Agenzia Fides began when Sheikh Salem Abdul Jalil, Undersecretary of the Egyptian Ministry of Religious Endowments (Awqaf), during a private channel – Mehwar - gave an exegetical explanation of Qur'anic verses concerning non-Muslims. In such context, citing the Qur'an, Jalil described Christians and Jews "infidels" (kafar) because they refuse to follow the teachings of Prophet Mohammed and are called to convert to Islam before they die if they want to avoid divine punishment reserved for infidels after life on earth. Commentators and analysts vented their disapproval of Abdul Jalil’s statements whoaccused the Islamic preacher of using the same language as jihadist groups who kill Coptic Christians defined as "infidels", also to undermine unity and national harmony. The preacher was also disowned by Mohamed Mokhtar Gomaa, the current Minister of Awaqaf, and such Ministry had already issued a statement on Wednesday 10 May to ban sheikh Jalil from preaching in mosques. Meanwhile, Egyptian media report that Abdul Jalil will be prosecuted on the basis of religious contempt. "So far", reports Boutros Fahim Awad Hanna, Bishop Coptic Catholic Bishop of Minya "here in Egypt there have been trials against Christians or Muslims accused of having offended Islam. This could be the first trial of a Muslim accused of having offended Christianity and Judaism".